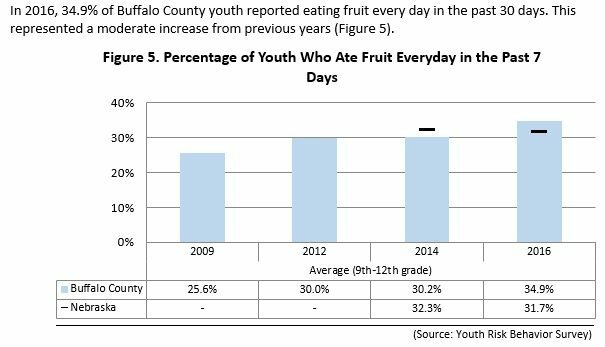 Click here to download the Active Living & Healthy Eating Data Report as a PDF. The “Active Living and Healthy Eating” strategic direction’s focus is to promote health and reduce chronic disease risk through the consumption of healthful diets and achievement and maintenance of healthy body weights. Improve health, fitness, and quality of life through daily physical activity. The Healthy Eating indicators reflect the health benefits of eating a healthy diet and maintaining a healthy body weight. The indicators also emphasize that efforts to change diet and weight should address individual behaviors, as well as the policies and environments that support these behaviors in settings such as schools, work sites, health care organizations, and communities. The Active Living indicators reflect the health benefits of regular physical activity among youth and adult. Regular physical activity includes participation in moderate and vigorous physical activities and muscle-strengthening activities. The obesity epidemic affects a variety of aspects of the health of communities. Residents who are considered overweight or obese are at risk for other health risks as well as significant medical expenses associated with obesity. According to the Center for Disease Control and Prevention (CDC), “research has shown that as weight increases to reach the levels referred to as “overweight” and “obesity,” the risks for the following conditions also increases: Coronary heart disease, Type 2 diabetes, Cancers (endometrial, breast, and colon), Hypertension (high blood pressure), Dyslipidemia (for example, high total cholesterol or high levels of triglycerides), Stroke, Liver and Gallbladder disease, Sleep apnea and respiratory problems, Osteoarthritis (a degeneration of cartilage and its underlying bone within a joint), Gynecological problems (abnormal menses, infertility). There is also a significant economic impact of obesity. The estimated annual medical cost of obesity in the U.S. was $147 billion in 2008 U.S. dollars; the medical costs for people who are obese were $1,429 higher than those of normal weight (Source: www.cdc.gov). 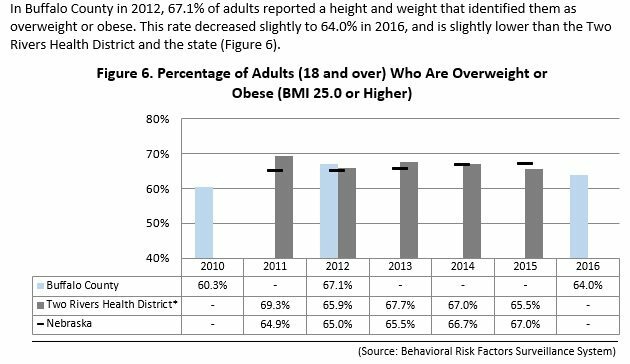 The U.S. is expected to spend $344 billion on health care costs attributable to obesity in 2018 if rates continue to increase at their current levels. Obesity‐related direct expenditures are expected to account for more than 21 percent of the nation’s direct health care spending in 2018. 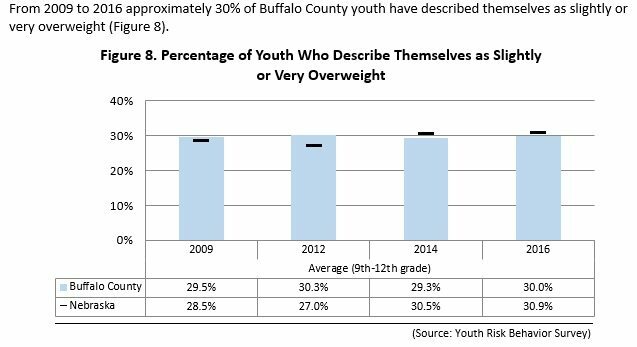 Buffalo County Community Partners seek to lower the percentage of the population that is considered overweight or obese by researching evidence based strategies proven to be effective. The 2020 well‐being measures (and objectives) for “Active Lifestyle and Healthy Eating” are listed below. 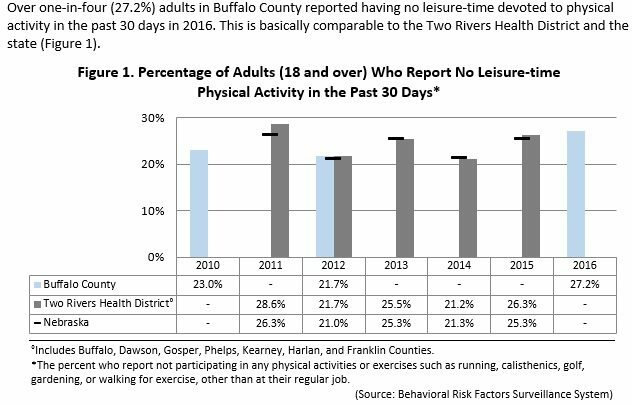 Well-being Measure: Decrease the number of residents reporting NOT being active. Well-being Measure: Decrease the number of youth that watch more than one hour of TV daily. Well-being Measure: Decrease the number of adults with a BMI greater than 25. Well-being Measure: Decrease the number of youth at risk for becoming overweight.